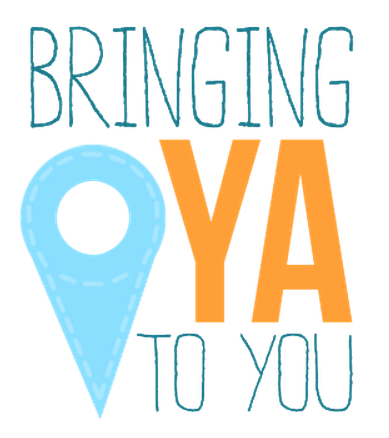 We are so excited that's it's nearly time for the big YA2U events that we've been working on since January! It's going to be so great to meet everyone who voted for us, and visit the schools that really made an effort for us to come visit. We only wish we could visit everyone--you guys were awesome, and make us really want to road trip around the globe! As we stated earlier, we're doing two live events, and a video event. The video event will be sent by DVD to the Lewisville Library and School systems, and a shortened and edited version will be uploaded for everyone to see as well. Event details: We'll start with a panel discussion about our works and writing, then move on to audience Q&A. Please bring your questions! This event is not ticketed and is free and open to the public. You may bring outside books for us to sign, however, please support the bookstore at the event as well. Notes: There is parking behind the building (parking lot behind the building off W. Sumter Street) or on the road to the right directly past the building (it's a one way street). Seating limited to 200 people. We're pleased to announce that we've finalized the details for our winning cities visits, and are eagerly preparing for the stops on the tour! Event: We'll be doing a panel discussion with the students, followed by a question and answer session and signing. This is just for the kids at Algood, as it was their votes--organized by the wonderful Ms. Young--that led to Cookeville winning. Public Visit: Open to EVERYONE! Event: We'll be doing a panel discussion with the students, followed by a question and answer session and signing. This event is open to everyone, is free, and should be a lot of fun! Please come by with your questions. You're welcome to bring your books from home, but BAM! will be on-site to sell copies as well. Location: The Board Room in the new central office building (formerly Shelby Middle School). Seating limited to 200 people. Event: We'll be doing a panel discussion with the students, followed by a question and answer session and signing. Each school in the district will be coordinating which students attend this function. Event: We'll be doing a panel discussion with the students, followed by a question and answer session and signing. This event is open to everyone, is free, and should be a lot of fun! Please come by with your questions. You're welcome to bring your books from home, but there will be a vendor on-site to sell copies as well. Video Visit: The logistics of having a Skype visit open to everyone may be a little prohibitive at this time. We're currently working to record one of the visits, with a special message to Lewisville, and present the DVD to libraries and the school district. We're also going to try to have a visit later on in the year, if we can get funding. More info as this comes available. We are so incredibly thrilled to announce the winners! First, an apology for the delay: it took us a little longer than we thought to confirm all the winners (but please trust us in knowing that we triple checked each entry by hand to ensure the winning cities were valid). And then we worked with a few contacts in the winning cities to come up with dates for the events, which we currently have set for April 2013. So, without further ado, here are all the participating authors to announce the winning cities of the YA2U program! Because Cookeville and Shelby are so close together, we were able to swing doing two live events in one week. Lewisville is a little further away, but we're going to work with the school and/or library system there to do a video program for them. Again, thank you everyone for participating. 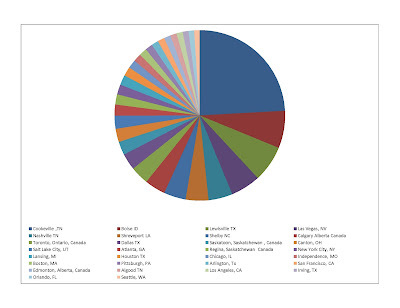 It was awesome to see where people were--this is definitely information we'll be sharing with our publishers in the hopes of sending more book tours your way. We'll post specific dates and times of events as soon as we have that information finalized. I'm very pleased to announce that YA2U was an amazing success! I loved hearing all of your stories about which city we should go to next, and I truly wish I had a teleporter so I could visit you all individually and thank you for your support. It took us awhile to count the winners because, in the end, it was ridiculously close. More than eight thousand people voted for a city, from Portland, Maine, to Portland, Oregon and everywhere between (including Canada, which knows how to represent!). Of course, from the start, we said there could be only one winner. For two key reasons: first, we're paying for this out of our own pockets, and second, we're working with five different busy schedules. But...the top three cities each got over thousand votes. Each. And in the end, the winning city only won by a couple hundred votes--enough to make it a clear winner (and trust me, we triple checked), but also so close to the next two cities. So we're going back on our word. We're not doing one city visit. We're going to do two. * And, additionally, we're going to give a third city a free Skype visit with all of us. We're still hammering out exact dates and working on a splashy announcement, but we wanted to let you know that we have picked a winning city and are working on arrangements to visit the other cities SOON. We're still working behind the scenes to ensure that we have the right city picked as the official winner of the YA2U contest--we had a lot of last minute entries and we want to verify they're all valid before we announce. Congrats to Lauren! An email has been sent to her. And thank you everyone who's been playing along with us! We had more than fifteen thousand entries for the book prize, and over eight thousand entries for the city visit contest! Holy shizz you guys! 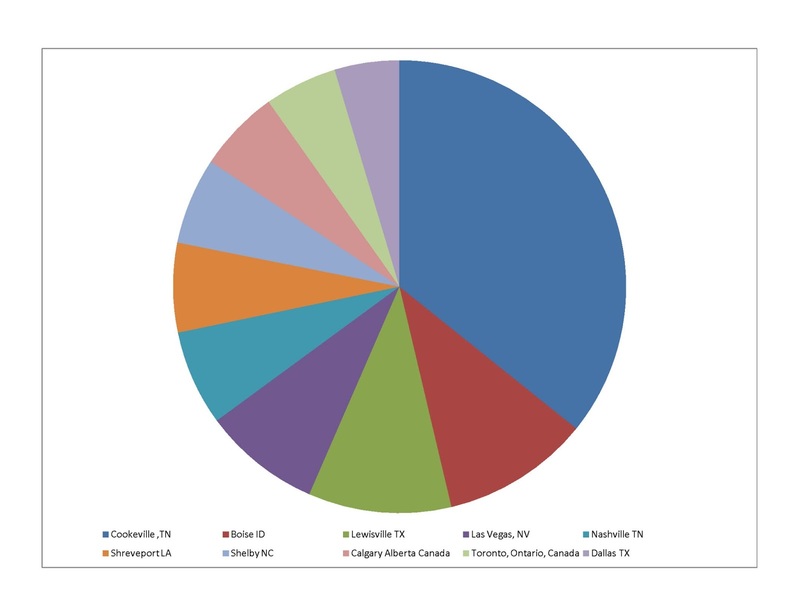 Due to popular demand, below is a list of the top 30 cities in the competition. And I really cannot emphasize it enough...it is still anyone's game. Keep voting! Just a note: The charts are typically about a week behind--at the end of each week, we take the current results, delete duplicate and false entries, and then make the chart. Since this chart was made, we had a huge burst of votes--more than 500 more votes!--which means the rankings will definitely change by next week's chart.